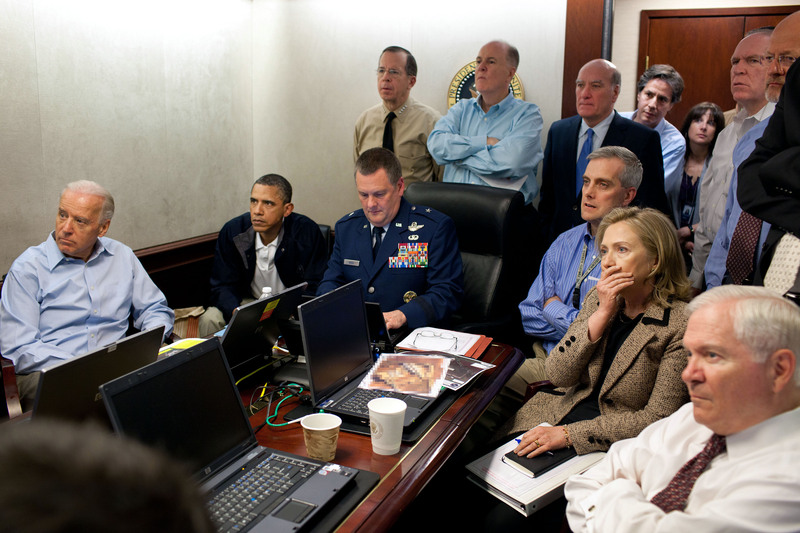 Doesn’t the right-wing’s favorite new discovery — that Obama called off the raid on Bin Laden three times, before finally committing U.S. forces to the historic mission — better support a theory of his agency? If Obama did something more than just say “go” the minute the battle plan crossed his desk, if (for example) he decided the time wasn’t right for some salient reason, and that delay made some appreciable difference, isn’t it fair to credit him, as commander-in-chief, for leaving tactics to the soldiers but making a uniquely successful strategic decision (cf. “American Thinker“)? Probably. But only if you allow for a possibility that force isn’t always the best option, but must sometimes be tempered by thought. And that’s a card that’s clearly not in the Republican Party’s deck. Well, does the use of drone to kill American citizens without due process count as “use of force tempered by thought?” If so, then this President is being consistent – though I loathe that consistency vehemently. if not, then he’s being politically opportunistic, and thast makes him no better then his predecessors. That was completely uncalled for. Mr. Obama, our PRESIDENT, is not as unthoughtful as our past presidents. His hesitation and thought in decisions probably saved many lives. Not that we would know now, thank the Lord.